Say Happy Birthday with a spa gift! Let the soothing qualities of passion flower and olive oil provide a rejuvenating spa experience for a special someone. Regardless of the occasion, this gift is sure to let them know you care. 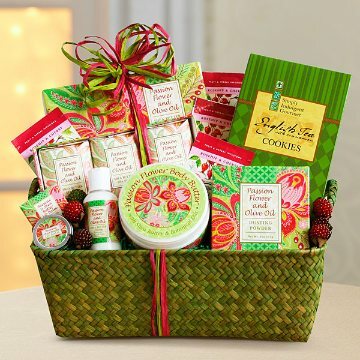 This gift includes the following: A woven sage green basket which holds Passion flower and olive oil body butter enriched with Shea butter, cocoa butter and virgin olive oil. A fragrant dusting powder is included plus a set of rich Shea butter spa soaps, moisturizing Passion flower and olive oil lotion and hydrating lip balm. They will enjoy with calming rosehip and cherry tea and sweet English Tea cookies.